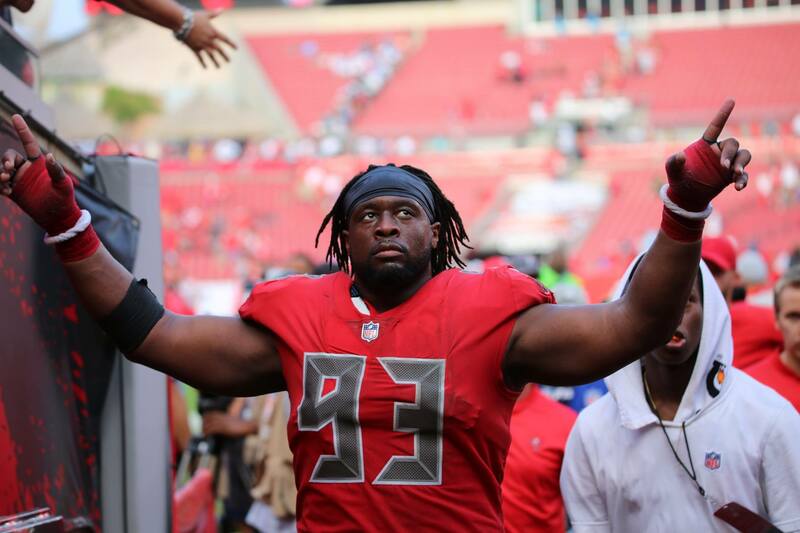 TAMPA, Fla. – The Tampa Bay Buccaneers announced today Gerald McCoy as its nominee for the Walter Payton NFL Man of the Year Award, presented by Nationwide. Considered one of the league’s most prestigious honors, the Walter Payton NFL Man of the Year Award presented by Nationwide recognizes an NFL player for outstanding community service activities off the field, as well as excellence on the field. Each of the league’s 32 nominees were announced today. This fall, McCoy launched Gerald McCoy’s Patricia Diane Foundation. The year-round program, in honor of his late mother, is focused on supporting single-parent households, a cause that has remained central to McCoy’s charitable efforts over the years. Through hosting youth football camps in Tampa and his hometown of Oklahoma City, OK., to spearheading the team’s annual “D-Line Delivers Christmas” event, to sponsoring a special gameday experience for thousands of local community members, McCoy has remained passionate about giving back to underprivileged families and children in need of support. McCoy – a six-time Pro Bowler and nine-year veteran – has been embedded in the Tampa Bay community since he arrived in 2010, and this past year has been no different. In September, McCoy helped launch the Buccaneers Social Justice Initiative, for which he serves on the four-person Social Justice Board. The player-led program aims to create real change in the Tampa Bay community by coordinating unique interactions and events surrounding societal issues. McCoy led the program’s inaugural event at the Tampa Police Citizens Training Academy, where he participated in simulations and discussions with law enforcement about challenges facing society today. McCoy also joined teammates on a visit to the Zephyrhills Correctional Institution to interact with inmates and share stories of perseverance. Many of McCoy’s charitable efforts have become annual traditions. The only two-time winner of Pop Warner’s prestigious “Inspiration to Youth Award,” McCoy has led the Buccaneers’ “Cut for a Cure” fundraising efforts since the team’s involvement in 2013, personally donating tens of thousands of dollars to the National Pediatric Cancer Foundation. His support for local initiatives has included serving as a celebrity participant in the “Fashion Funds the Cure” event, being the spokesperson for the Glazer Family Foundation’s Vision Program and working with Special Olympics Florida at Buccaneers Training Camp, among many notable efforts. His philanthropy extends throughout his family, which coordinates the annual “McCoy Family Christmas” program to surprise dozens of single-parent families with gifts for the holidays. As this year’s nominee for the award, McCoy will wear a Walter Payton NFL Man of the Year helmet decal through the end of the season in recognition of his accomplishments on and off the field. New this year, during the weekend leading up to Super Bowl LIII, all 32 team winners will be highlighted as finalists and recognized for their important work. The 2018 Walter Payton NFL Man of the Year will be announced during NFL Honors, a two-hour primetime awards special to air nationally on February 2, the eve of Super Bowl LIII, on CBS. NFL Honors will be at Fox Theatre in Atlanta. Five-hundred thousand dollars will be donated in the name of the 2018 winner. $250,000 will be donated in his name to expand Character Playbook, the NFL and United Way’s digital character education program. An additional donation of $250,000 will be donated to the charity of his choice. All other 31 nominees will receive a donation of $50,000 in their name to expand Character Playbook, and an additional donation of up to $50,000 to their charity of choice. All donations are courtesy of the NFL Foundation, Nationwide and United Way Worldwide. Fans are encouraged to participate in Nationwide’s fourth annual Charity Challenge, a social media campaign designed to support and promote team nominees. Fans can vote by using #WPMOYChallenge on Twitter with their favorite nominee’s last name somewhere in the post between December 6 and January 13. The player whose unique hashtag is used the most will receive a $25,000 contribution to their charity of choice, courtesy of Nationwide. Hashtag information, official rules and more information on the Walter Payton NFL Man of the Year Award can be found at nfl.com/manoftheyear.